You do not have a website, and don’t really know how to get a great one. You may have heard of WordPress to create a great dog breeder website or blog but you know very little about it. You do have a website, but it is not how you would like it to be. You want a professional-looking website without coding or technical knowledge required. WordPress is a Content Management System that allows you to quickly install, customise and manage your dog business website (or blog) with articles, videos, galleries, comments, etc. No coding is required, you control everything from the intuitive WordPress’ administration panel! 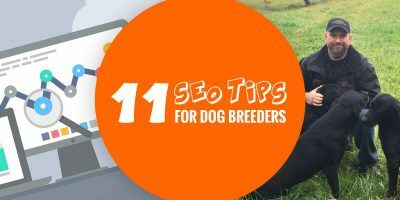 If you need more convincing, I came up with 10 reasons why you should absolutely use WordPress to create your dog breeding website or any dog-related website. Once you are convinced, you can get your dog breeding website up and running within 5 minutes with our step-by-step tutorial. WordPress is the most powerful free tool of its kind. Yes, completely free. The only thing you need to pay for is the hosting service, at around $3/£3 per month and your .com domain name at $9/£9 per year. 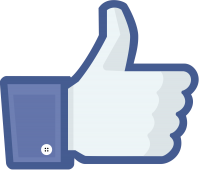 It is peanuts when you know how much money and value a website brings to your business. The one-click WordPress install in your BlueHost Panel. If you already have a web host and they do not have a one-click install, you can do it yourself: it is still super easy. Simply download the latest version of WordPress for free here, upload it on your host and start the installation. It takes 5 minutes. Every WordPress installation comes with the default theme. It is a well-made design that can be enough for most webmaster but we highly recommend a more personalised WordPress Themes in line with your business or industry. There are two categories of themes: free WordPress themes available on WordPress Themes directory and premium WordPress Themes available on reputable marketplaces such as ThemeForest or ElegantThemes. Same here, no need for coding, just a one-click installation and you can then play up with your theme’s settings: easy! Plugins extend WordPress with business-specific features, new functionalities and give WordPress its “can do anything” reputation. There are a wide-range, almost infinite number, of plugins you can choose from but don’t fall into the overloading trap: keep it simple, keep it functional, keep it efficient! 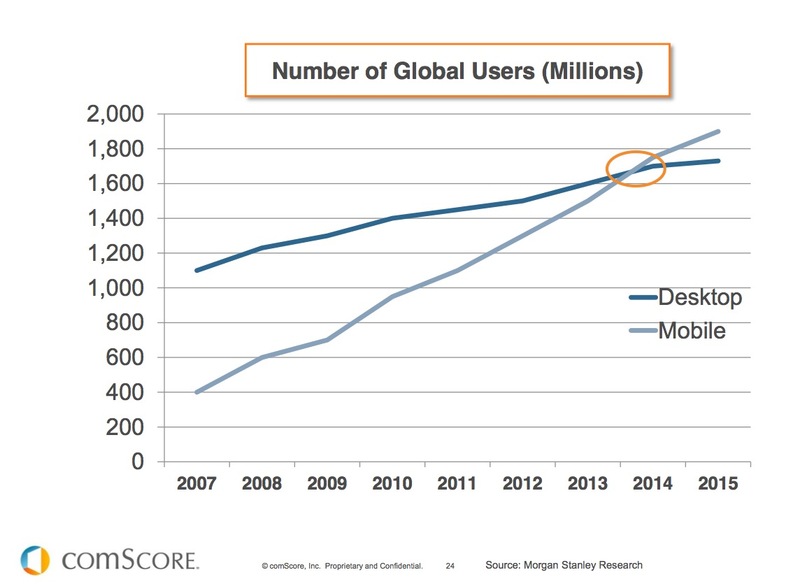 Over the last years, mobile devices such as smartphones and tablets became first and overtook desktop and laptop computers in web traffic shares, worldwide. It only means one thing: your website must be mobile-friendly, and this is called mobile responsiveness. 99% of WordPress Themes built over the last years are mobile responsive which means you do not need to worry about visitors on smaller screens, your website will automatically adapt! You can try with breedingbusiness.com, check it out on your mobile now. Everybody who runs its own website wishes to be on Google’s first page to receive a lot of traffic daily without doing much. It is not easy to start from scratch but using WordPress helps a lot thanks to it’s SEO-friendliness, but what is SEO? The acronym SEO stands for Social Engine Optimisation, it is what makes Google and others search engines like a website more than another and WordPress developers understood it from day 1 and built a Google-friendly tool with clearly laid out pages, structured headings and content, menus and illustrations. You just have to write your pages, articles and the rest will happen behind the scenes without you noticing. If you want to actively improve your Google ranking, WordPress SEO by Yoast helps you improve your pages to rank higher in search engines with clear built-in guidelines and tips in your admin panel. Regardless of how great a product is, we all have questions or problems at some point. WordPress is one of the most active communities of the entire web with dozens of active forums, portals, how-to guides, youtube videos, etc. If you have a question, it will be answered promptly. Here are a couple of links to the most animated and active WordPress communities: the official WordPress message boards for technical support and ManageWP.org for news and updates. We are also relaying the most important WordPress news and updates here on BreedingBusiness.com since most of dog breeders and dog-related business people use WordPress to run their own website. Once your dog breeding or dog business website is online, you obviously need to add content to it. Pillar pages such as “About us”, “Contact Us”, but also content specific to your activity and industry: pictures of your dogs, opening hours if you are a dog grooming business, litters planned, puppies for sale, your dog competitions results, pedigree of your dogs, etc. Screenshot of the Admin Panel while I’m editing this very same article! WordPress has it all sorted with its powerful yet simple post creator. Formatting has never been that simple as with no fuss, it goes straight to the point: letting you write great posts that your audience will love reading, sharing and engaging with. If you need a special feature to write your posts (such as an advanced table builder), pick your favourite plugins from the free WordPress Directory! Many themes have these social functionalities built-in, but just in case, there are a herd of free plugins doing it including the powerful and must-have Jetpack with its multitudes of social tools and WPSSO, a great plugin to optimise your content on social medias. 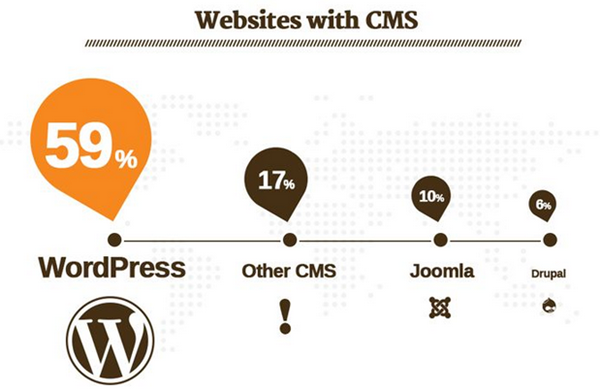 Not only WordPress is by far the most popular content management system ahead of its competitors (Joomla and Drupal), it is also a mature solution that has been used and abused all around the world since 2001, by millions of experienced users. Bugs have been found and corrected, features have been tried, dropped and then better re-instated. Ideas are still being experimented, and the whole open-source community is helping WordPress to keep its advance and let millions of people build tomorrow’s web. It is a free tool, so you should be part of this WordPress world! 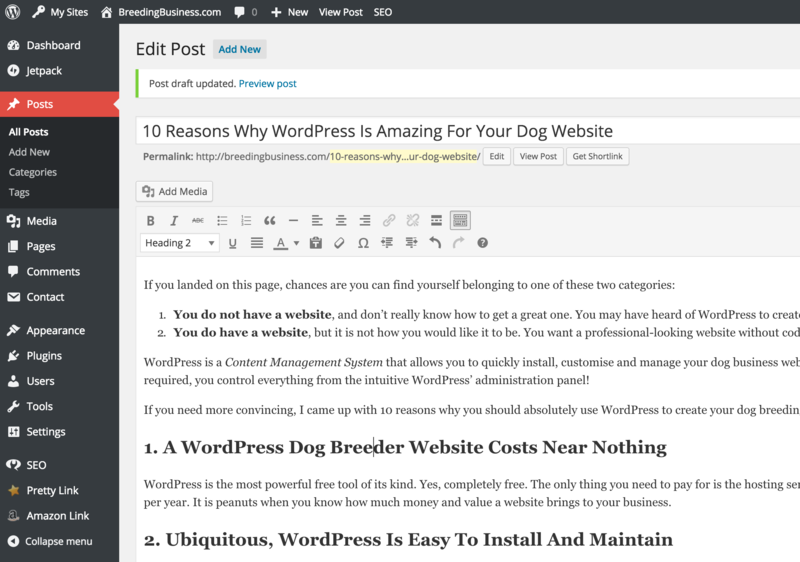 We wrote a great article “Create Your WordPress Dog Breeder Website In 3 Easy Steps” to guide you, step by step, so do not waste any time and get yourself going! What is Breedr for WordPress you ask? Well, we’ve been listening to you guys! 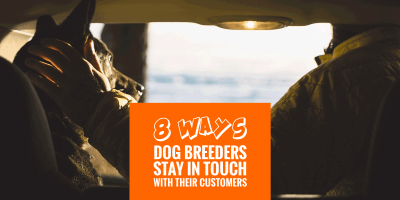 We’ve spoken to a lot of breeders running their website with WordPress and you’ve all told us one simple fact: there is (was ;)) no plugin or out-of-the-box solution for dog breeders. Therefore, websites looked too much like a blog and too less like a kennel website. Things have changed. We’ve developed an extremely powerful WordPress breeder plugin called…….. Breedr for WordPress! Install it in 3 clicks, and this is it, just add your dogs, litters and it automatically generates pedigrees, pages, galleries, award and title lists, health screening logs, etc. It is delivered with several widgets and shortcodes for enhanced flexibility! You can even write a regular blog post and add just what you need, for example one of your dogs’ pedigree. You can get Breedr for WordPress or see a live kennel demo website.